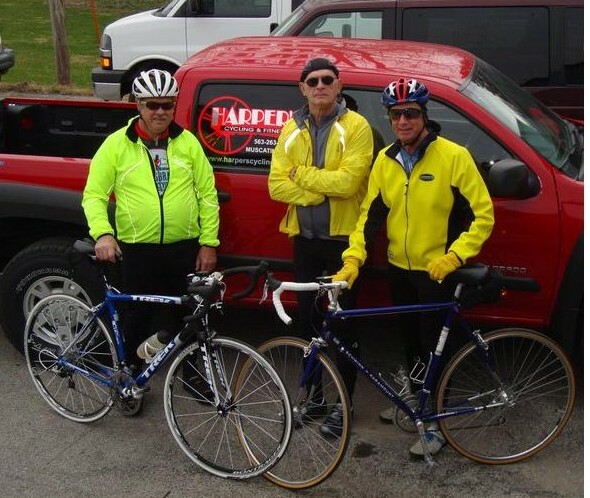 Three guys on bikes: Charlie Harper, from the left, Chuck Vesey and Bob Hayes, all of Muscatine, still ride thousands of miles annually. Their average age is 71.3. Toby Keith ought to meet Bob Hayes. And, for that matter, Chuck Vesey and Charlie Harper. But for today, the spotlight is on Hayes, a 69-year-old retired Muscatine accountant. While the country music superstar sings the anthem for how lots of people age, Ain’t As Good As I Once Was, Hayes is riding a bicycle faster than ever. He retired 4 1/2 years ago after working 28 years for HNI Corp. and its subsidiaries. In 2012, he bicycled 4,000 miles and he set a personal record during the roller races held Saturday at Harper’s Cycling & Fitness in Muscatine by going two miles in 7 minutes and 22 seconds. “That’s my fastest time ever in 20 years,” Hayes said afterward. And he set his record a little more than two years after suffering a stroke that forced him to relearn how to do many things. I started thinking about Bob, who has become one of my many friends through the Melon City Bike Club, as I began preparing to give a program for the Muscatine Eldercare Consortium. I will be the group’s speaker at noon Wednesday at Valley View Assisted Living. It’s not likely that those who care for aging Americans encounter someone like Hayes every day, but he epitomizes the way everyone should work at aging. And his recovery from a stroke, I think, shows how anyone — regardless of age or condition — can physically get stronger. Hayes has always been active. He started playing tennis in high school and still plays three or four times a week. He started biking seriously in 1975 because he wanted to ride on the Des Moines Register’s Annual Great Bicycle Ride Across Iowa. And what he knows now is that he plans to never quit biking. “It’s more rewarding today, knowing I can still do it,” he said. More on the roller races: I didn’t see results from the races Saturday at Harper’s. But it’s likely Charlie or Greg will read this. Maybe one of them will post the results below this in the comments. Local results from the Indoor 2-mile timed roller race @Harper’s Cycling & Fitness. Jon Sulzberger’s 5:54.1 was 1st place category 4. Jon rode 6:26.6 for his Masters 40+ time. Greg Harper, race organizer, “Rollerhead” time was 6:19.8. Robert “headwind” Hayes time was 7:22.2 best time for the oldest rider of the day!